I love to shop for bargains and where else can you find real bargains other than a thrift store? There's a big thrift store next to a popular Vietnamese restaurant about 20 miles from where we live. I love Vietnamese food and after a meal at the restaurant we would head on towards the thrift store. Among the items we always look out for and buy at the thrift store are educational toys, clothes for the kids, big toy cars for Duncan, and purses and backpacks for Denice. 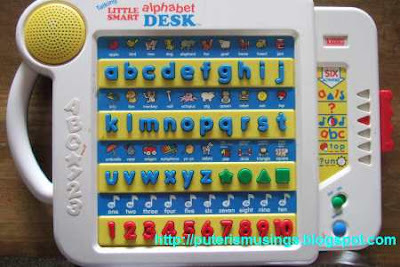 Yesterday after the kids' reading lesson with Kathy, she suggested I get a Fisher Price educational toy where they can learn to repeat their letters, numbers, words and even spell. I don't need to get a new one, I told her, and showed her something similar to what she was referring to. It was something that I got at the thrift store. Alphabet desk that I got from the thrift store. 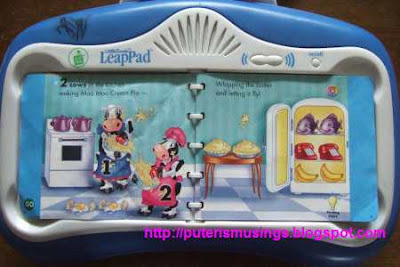 Leap Pad, also from the thrift store. The thrift store is an excellent place to find educational toys, and for only a fraction of the retail price! 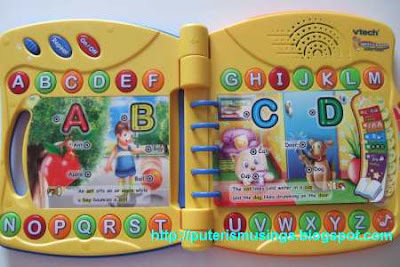 Doug recently bought an interactive educational toy (see pic below), brand new at Toy 'R' Us, and the all the kids have to done with it was press one button after another. They do not do what the voice in the toy tells them to do. I think they need someone like Kathy help them focus and do what the voice in the toy tells them to do.